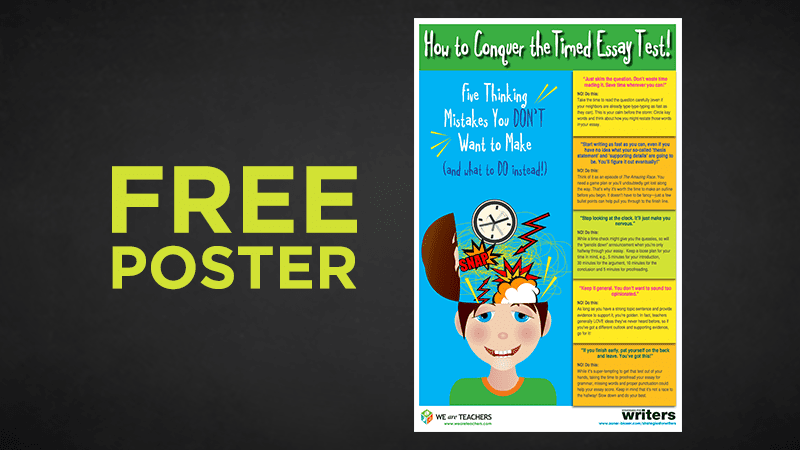 Save your students’ sanity with this printable guide. Strategies for Writers is a proven-effective, standards-based writing and grammar solution that teaches students to use the writing process and six traits of writing to become effective writers—and how to apply this knowledge to written assessments. The Next Generation Assessment Edition of Strategies for Writers equips educators with the tools they need to raise writing results. Download up to nine free Strategies for Writers lesson plans complete with teacher and student pages. Composing an essay while the clock ticks is one of the most challenging tasks our young writers will face. It requires concentration, organization, and a command both of essay structure and the subject at hand. Before your next essay test or timed writing exercise, review these dos and don’ts with your students. 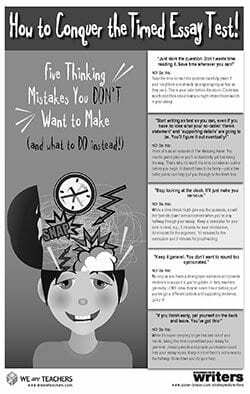 Model the process with a sample essay question, inviting students to read aloud each “thinking mistake” and “do this instead.” Together as a class, do each step. Ask students to identify the key words in the question that tell the writer what to do. Work together to devise a thesis and sketch a quick outline. Print these mini-posters on 8”x11” or 11”x 17” paper. Or to print a super-sized version for your classroom wall, save the pdf onto a flash drive and take it to a copy shop.